1. Place the stamper on a hard surface. Lock the stamper in the open position by depressing the stamper all the way down. Slide the button on the back of the stamper to the locked position. The stamp will lock exposing the text plate in the down position to make it easier to load your characters. 2. Turn the unit upside down with the gold wording “COM-PAC DELUXE MARKER” facing toward you. 3. Remove the clear cover from the character type set. Choose the first character desired, remove it from the set using the provided tweezers, and place it on the far right side of the die place (the ribs on the character and on the text plate will interlock). Choose your next character and place it just to the left of the first character. Continue until you have spelled your name or number sequence backwards. IMPORTANT: After placing your letters and/or number on the text plate, hold up to a mirror before inking pad, if type is correct names and numbers will read the proper way in the mirror. 4. Remove the ink pad cover. Be sure the ink bottle cap is tight and shake the ink bottle well. Open the bottle and gently squeeze ink on the pad distributing it evenly using the tip as a spreader. WHEN NOT IN USE, COVER THE PAD WITH THE PAD LID TO AVOID DRYING. 5. To insert the inked pad into the stamper, slide the locking button on the stamper back to the unlocked position, so that the stamper releases. Partially close the stamper so that the empty slot on the back of the stamper is fully visible. Hold the inked pad by the small grip tabs, with the inked surface facing down and slid the pad into the stamper. Release the stamp. NOTE: Be sure that the inked pad surface faces downward when the stamper is upright. 6. Test it! Once the pad is in place, make an impression by pushing the stamper down firmly on a piece of paper. Use firm downward pressure to ensure complete coverage. The stamper will spring back automatically. Ensure that your letter sequence is correct before proceeding. If too much ink was applied, you can make repeated impressions on a small piece of fabric to help remove the excess ink. 7. Stamp your message on the center of the enclosed card using the guidelines to place the stamper. 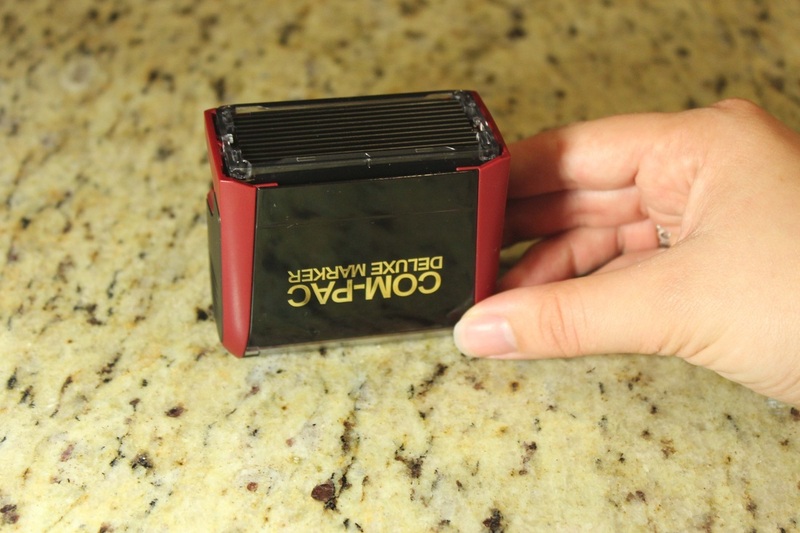 Punch out the card and insert it under the clear plastic shield on the top of the stamper. Replace cover.